Depression or low moods are a very unpleasant condition to experience at any time of the year, but the symptoms and sensation of low moods can be particularly worse, during the cold and grey winter months. Depression is a human experience where there is a general feeling of being pressed down by the external world, which can be brought on by external events and conditions. During these dark days and periods, you can experience feelings of emptiness and immense feelings of guilt, anger, despair rejection, disappointment, but the overwhelming feeling is one of a sense of feeling isolated and hopeless. As a general rule, we all tend to feel generally better during the summer months and we all get the winter blues at times, especially during those cold gloomy winter days where there is poor light and it gets dark early. But for some, winter depression can last throughout the entire winter. Winter depression (SAD) can set in at the end of Autumn, usually coinciding with the shorter days, hitting its peak during the mid winter months and then things gradually begin to pick up as spring approaches. It is not surprising that we feel better in the spring summer. Nature provides us with a canvas of beauty as all the flowers and plants emerge and bloom, the birds begin to nest and our sleeping world awakens and comes to life. The days are longer and warmer, and there is much more light. And from a psychological perspective, we have a lot more to look forward to. Like, getting outdoors in the warm summer months. We are more active, which also helps promote the feel good endorphins and we have our summer holidays and days out to enjoy. From a psychological perspective. We view winter as gloomy and depressive, the plants die off and the days are short and dull. Not many people look forward to winter, and often we remain stuck in doors and we can become less active and enthusiastic. In summer we bounce out of bed full of zest and enthusiasm, whilst in the cold and dull winter days, we just feel like staying under the duvet and lying in bed. Everything about the summer exuberates positive energy and everything about the winter seems negative. If you can start to be more proactive and positive about the winter. Maybe doing something creative with your time or do more of the things that you enjoy, as well as keeping active, both mentally and physically, can help from a psychological perspective. As a human species, we are psychologically and physically affected by light. If you observe the animal kingdom and nature. Then you will notice that, some species are very active in the summer months, and they hibernate during the long winter months. Although, we don't hibernate in the winter. We still tend to be less active, during the dull and gloomy winter days. The duration and the intensity of light, drastically changes from the summer to winter months, and this process can affect us in many ways. Ranging from how we feel, our choices and decisions that we make and what we do or do not do. During the winter days. Some people can go to work in the dark. They then spend their day working in dull conditions and then they come home in the dark. For the housewives, they can remain stuck in doors performing their daily chores, with a lack of bright light outside and on the inside. If we go long periods without enough bright light, then this can affect the mind and body. Our mind an body reacts to light. When it gets dark, we start to feel more lethargic and tired, when it starts to get light, we become more alert and alive. Sustained periods of a lack of bright light, can affect our mood, our motivation levels and thought processes. And light deprivation, can also affect the quality of our life. During the late autumn and winter periods where many of us are often deprived of bright light, they can start to experience unpleasant feelings and mood fluctuations. Even if your workplace or home is well lit up. It is not necessarily enough to replace the natural sunlight that you get in the summer months. It can be particularly bad after the Christmas period. On the run up to Christmas. Many people look forward to the holiday festive season. But, as people return back to the reality of work or everyday life. The next few months ahead, where it is cold and the days are short and often dull, combined with the thought of no holidays due for a while, then this can have a negative effect on you. The result of a shortage of bright light and feeling a bit pessimistic can result in Seasonal Affective Disorder and feelings of low moods, lack of motivation and enthusiasm, low drive and poor quality or interrupted sleep. Although many people class depression as a mental disorder, the mind a body is one whole intricately complex system that is all connected together. Depression, is often more severe in the winter months, causing a depressed mood or loss of interest in many things. There could be a combination of things that can contribute to Seasonal Affective Disorders and depressed mood. Daily life can contain a host of many stressful experiences for many people. We all know the dangers of stress and how it can damage your health and affect your mood. Life's daily challenges can, however, seem even harder to cope with, if you're feeling a bit overwhelmed or you are not feeling your best. During the winter months. It can be very easy to allow your mind to wander on to the negative. All of which can take a toll on your emotional, mental and physical state and well-being. If you're feeling the a bit stressed and you're suffering from light deficiency, then this can drag you down and disempower you tremendously. Bright light can stimulate us in many positive ways and motivate us tremendously, whilst light deprivation can make us feel lethargic, disinterested and low. Feeling sad and low, can also have a negative impact on how you perform both mentally and physically. Getting more light, keeping active, eating healthy and relaxing your mind and body, can give your mind and body a much need boost and leave you feeling more relaxed, happier, alert and energized. Light and Sound Stimulation, also known as brainwave entrainment, have been found to increase brain activity through mind machine and music using varied flickering lights placed over the eyes, and through the use of specified sounds and tones heard while wearing headphones. Through the use of audio (headphones) and visual (eye frames with LEDs) stimulation, listeners are gently guided into specific states of mind. Each audio beat and light pulse are, a specifically designed frequency. Minds think and operate in terms of frequency. Brainwaves change frequencies based on neural activity within the brain, be it by hearing, touch, smell, vision/or taste. These senses respond to activity from the environment and transmit that information to the brain via electrical signals. Hearing and vision are considered the favourable senses for affecting brainwaves safely. By presenting these beats and pulses to the brain, within a few minutes, the brain begins to mimic or follow the same frequencies as the stimuli (the beats and pulses). This process is known as brainwave entrainment. The work and studies by Huxley (1963) and Budzynski et al. (1999) have demonstrated that rhythmic information can produce unique sensory experiences, associated with the properties of the stimulation. 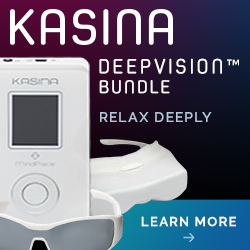 These can include sensations such as activation, relaxation, discomfort and visual experiences. increase levels of a variety of neuro chemicals and hormones, including endorphins and growth hormones. depression and pain, to mental alertness and memory. The study (Peniston et al., 1989) in which EEG biofeedback was used to train a group of chronic alcoholics to enter first the alpha and then the theta state, while another group served as a control group. They discovered that the alpha-theta group showed and extraordinary recovery rate many orders of magnitude grated than the control group. imaginativeness and self-control, and significant, decreases not only in depression but also in anxiety and other problems. The use of light and sound meditation aid's, can help to reduce stress, improve your mental focus, meditate, relax, break undesirable states like anger, and enjoy a visual psychedelic experience without drugs. The positive benefits of light and sound stimulation, can be. Changing your brainwave frequencies, feels like the changing of the seasons, like you transforming you from winter to spring, but you don't have to wake months and months. It is important to take good care of yourself. During the long winter months is is easy, to just sit around watching TV and spending hours on electrical devices, eating low in nutritional foods. In todays world we live in a society of convenience foods and a lack of activity. Many people live stressful lives and they are over stimulated by outside influences, which affect the way they feel. Sometimes you have got to put the breaks on and get a bit back to the basics of life and live your life they way nature intended it to be. We need to start to, fill our minds with messages of positivity and optimism. Pinning up cards or putting up posters, with positive quotes around your home, or carrying a card with positive and uplifting words and quotes, can help to promote good feelings. Even during the winter months do something more positive and work towards taking better care of ourselves as well as working towards vibrant health and feeling the best we can. Vitamin D is often called the sunshine pill and it is believed to be one of the most important vitamins to help the healthy functioning of a the body. It is also essential for good bone health. Vitamin D is also thought to help boost the immune system, which may help you to avoid the winter colds and flu outbreaks. Various research has also suggested that there might be a link between a vitamin D deficiency and depression or low moods. It is thought that the reason for this is because vitamin D can help in the functioning of the brain, especially as it is thought to help promote the release of the feel good endorphin "serotonin". Vitamin D is also thought to help improve mild anxiety symptoms. Sunlight is the best natural source of vitamin D. If you are being deprived of vitamin do, due to a lack of sunlight. If you cannot get adequate amounts of sunlight. Then you may benefit from taking a vitamin D supplement throughout the autumn and winter months. Many people either do not have access to the sun every day. Whilst others are reluctant to go in the sun, because of the health risks of to much sun exposure. If weather permits it. Then 15 minutes of sun on part of your body can often be enough. Try and avoid over exposure to sunlight. Positive minded people and those who take good care of themselves are more proactive and they're better equipped at dealing with the winter and they tend to suffer far less with colds and the flu. If you have over indulged with eating too many sugary sweets and alcohol during the Christmas period, then this may have a negative impact on your mood. Dehydrate, drink adequate amounts of water, make sure you get the required amount of recommended daily vitamins and minerals. It is important to take good care of yourself. If you can, get as much natural light as possible, reduce your stress and try to keep active. Having a dog, can be a great way to get you outdoors in the winter months, it will also keep you active. Herbal remedies, such as. St John's Worts, have been known to reliably boost your mood. Smiling for a few minutes at a time, at various times throughout your day can help to naturally lift your mood, as can looking up with your eyes. Our thought processes often match our moods and what we have come to believe, and it is important to be mindful so you can prevent your mind from wandering on to negative thoughts, especially during the winter months. A lot of people allow their negative thinking beat them or they allow their negative thoughts to take over their minds. These can leave people feeling upset and frustrated, as they feel as if they just cannot seem to break and escape these constant bad feeling thought patterns. Persistent negative thought patterns lead to negative emotions, like anger, sadness, loneliness, anxiety, fear, shame and guilt, to name a few. To break free of those same old tiring and exhausting negative thought patterns, changing your to a more positive attitude, is a must. Negative thinking and negative emotions can become hardwired into your brain. Trying to override your negative thought patterns, by picking better feeling thoughts, is a good step to take. But, the best way is to, change your feelings, first, and when your mood starts to change, it will become far easier, for you to think better feeling thoughts.